Adorn in the News: Rent - Borrow Bridal Jewelry and Occasion Jewelry! Click on each category below to see Adorn in the press. Adorn Brides is in the News with our innovative approach to renting - or borrowing - bridal jewelry for brides on their wedding day! Below, see the Adorn News stories and clips on this newest trend from Adorn Brides: RENT or BORROW bridal jewelry for your wedding! Also, read Testimonials from real brides who rented their bridal jewelry with us. Click here to view our full selection of bridal jewelry. The Wedding Wire 2013—We are excited to announce Adorn Brides has been chosen again to receive the Bride’s Choice Awards™ 2013. This award recognizes the top 5 percent of local wedding professionals from the WeddingWire Network who demonstrate quality and service excellence in the wedding industry. Looks like 2013 is going to be another great year for Adorn Brides – we just learned that we’re a winner of the WeddingWire Bride’s Choice Awards for 2013! We consider this a great honor at Adorn and are proud to report that we’ve won this award for each of the past five years! The Wedding Wire—Click on the image to the left to be taken to reviews from our past clients. We are proud of the rankings we are receiving and continue to receive. These comments from actual clients are why Adorn was given the Brides Choice award for 5 years running. The Today Show (May 11th, 2013)—Why buy designer fashion when you can rent? Whether you want to look like a princess for a day or a favorite celeb, the latest trend in getting the red carpet look is to head over to one of the websites that offers customers the ability to borrow/rent clothes and jewelry and then just send them back. NBC's Joelle Garguilo reports. The segment featured several of Adorn's pieces including the Chandler Earrings & Chadwick Bracelet worn by anchor Erica Hill. Whittaker Earrings & Spencer Necklace worn by host/reporter Joelle Garguilo. The Rachel Ray Show (January 25th, 2011)—Rachael Ray & Consumer Expert, Jennifer Jolly, featured Adorn Brides as one of Jennifer’s favorite secrets to (temporarily) get anything you need. In addition to a Artwork rental company and a Casket rental company, Adorn was showcased as the one and only place where brides can rent real diamond jewelry for their wedding day. The segment featured several of Adorn’s pieces including the Budding Necklace & Hartley Earrings worn by the expert Jennifer Jolly, Beckford Necklace, Valentine Earrings, Lockwood Earrings, Lockwood Necklace, Chadwick Bracelet, Livingston Bracelet & Budding Bracelet. 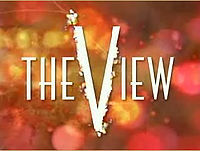 ABC’s The View (October 9, 2008)—The ladies of the view were wowed by Adorn’s fabulous selection of diamonds for rent. Celebrity concierge, Michael Fazzio, featured Adorn’s unique jewelry rental service, giving everyone a few insider tips on “How to Live Fabulous for Less”. This segment featured a variety of jewelry including Stevenson Necklace. ABC’s Good Morning America (August 1st, 2012)—Adorn's jewelry was used on the Good Morning America show that aired August 1st, 2012. The segment was about all the things you can rent for your wedding. This segment featured a variety of jewelry including Middleton Earrings and Chadwick Bracelet. click here to view the online article. 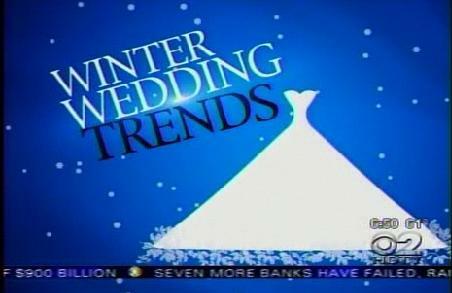 CBS Early Show (April 2009)—Consumer correspondent, Susan Koeppen, featured Adorn Brides as one of her three picks for amazing things you can rent for your wedding. In addition to a bridal gown rental company and a cake rental company, Adorn was showcased as the one and only place where brides can rent real diamond jewelry for their wedding day. The segment featured several of Adorn’s pieces including the Beckford Necklace and Lloyd Bangle. This segment featured the Spencer Necklace. The Morning Show with Mike & Juliet (June 9, 2009)—FOX's national morning show, Mike & Juliet, showcased Adorn Brides' diamond jewelry rental service as one of the latest greatest ways you can live like a celebrity for less. The hosts loved the idea so much, Mike wanted to take a piece of jewelry home with him. Watch closely and you'll see our own Laura Carrington has a cameo appearance! The Mike & Juliet show featured several pieces including the Lockwood Necklace. CBS 2 New York (October 24 , 2009)—TheKnot.com’s editor in chief, Anja Winikka featured Adorn Brides’ celebrity worthy diamond jewelry rentals as part of their 2009 Winter Wedding Trends. Of course, brides in the know can rent bridal jewelry any time of year! You can borrow diamond jewelry from Adorn in any season to complete the perfect wedding day style. The CBS 2 morning show featured several pieces including the Lockwood Necklace. Click here to see other videos and television coverage featuring Adorn Brides. 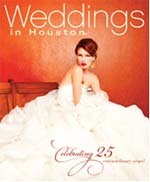 Weddings in Houston (2012 - 25th anniversary edition)—Adorn Bridal Jewelry was featured in the 25th anniversary edition of the magazine. Our very own Chief Style consultant was quoted in response to several wedding and style related questions. 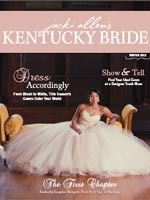 Kentucky Bride (Winter 2012)—Adorn Jewelry used for photo shoot - A Bridal Frame of Mind - Pages 77 thru 90. Photography by Victor Sizemore – Shot Location at The Club at Spindletop Hall. The product highlight featured the Lockwood Earrings, Lockwood Necklace, Chadwick Bracelet, Hartley Earrings, Lloyd Bangle, Coleman Pendant and Spencer Necklace. Also click on reviews of each product to see a close up –photo shoot. 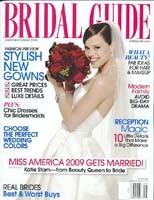 Bridal Guide (Sept/Oct 2010)—Our classic Clemons Earrings & Riley Bracelet are featured on the cover with Miss America 2009! Get Married Magazine (Spring 2010)—article on page 27: Searching for the latest trends for their spring issue, Get Married Magazine included Adorn in its “Something Borrowed” must-have list. Now Get Married readers are in on the secret that Hollywood has kept for years—you can borrow amazing diamond jewelry! The product highlight featured the Miles Earrings. Grace Ormonde Wedding Style Magazine (Spring 2010)—article on page 89: When Grace Ormonde Editor, Tracy Freedman tied the knot late last summer, she would have nothing but the best. Of course, that meant renting amazing diamond earrings from Adorn. Her lavish wedding was featured in the Spring issue of Grace Ormonde Wedding Style Magazine and online as well. Tracy wore the Abbott Earrings. For more details on Tracy's wedding click here. 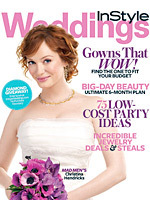 Bride & Bloom Magazine (November 2009)—article on page 46: Something Borrowed—From chic cabanas to eye catching dance floors, it seems everything wedding is rentable. The latest and greatest addition to the rental menu?—diamond jewelry. This month the editors of Bride & Bloom were so excited to you can rent diamond jewelry for your wedding, that they featured us first on their list of must have rentals. Want to rent a $10,000 diamond necklace for $290? Check out the Spencer Necklace. InStyle Weddings Magazine (Fall 2009)—page 2. Bringing celebrity style to weddings across the U.S., InStyle Weddings is the place to find the latest and greatest trends in bridal accessories. That’s why the editors at InStyle recently featured Adorn’s Lockwood Earrings in their Fall issue. Compared to the ultra expensive earrings Ann Hathaway wore to the 2009 Tony Awards, renting jewelry from Adorn Brides gives you the same look for a fraction of the cost. Rent bridal jewelry like the Lockwood Diamond Chandelier Earrings and bring some red carpet style to your big day! The product highlight featured the Lockwood Earrings. USA Today (July 8, 2009)-Couples saying ‘I don’t’ to expensive weddings—Article on front page: Quoted alongside celebrity wedding planner David Tutera, Knot.com co-founder Carley Roney, and editor in chief for Modern Bride, Antonia van der Meer, our very own Laura Carrington added her perspective on how the economic climate is effecting the wedding industry. Client Christina Joo Sethi, who wore the Ian Earrings, was featured in the article. Life & Style (July 6, 2009)—article on page 42: highlight on page 10: Known for their focus on all things fashion and celebrity, Life & Style picked adorn.com/brides as one of their “What’s hot this week” section. We are glad that the idea of bridal jewelry rental is catching on beyond the wedding industry. It’s perfect for any fashionista! The product highlight featured the Chadwick Bracelet. 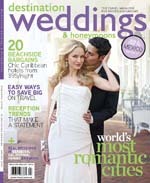 Destination Weddings & Honeymoons (Spring 2009)—article on page 42: As the go-to resource for anyone planning a wedding away from home, Destination Weddings & Honeymoons is one of the nation’s top wedding magazines. This season, the editors couldn’t pass up the opportunity to include Adorn Brides and the concept of jewelry rental in their “Brideideas” section. The article featured the Spencer Necklace. 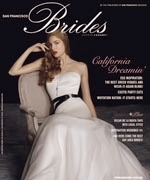 San Francisco Brides (January 2009)—article on page 31: From the publishers of Modern Luxury magazine comes the newest must-read wedding magazine to grace the bay area—San Francisco Brides. The pages are brimming with the latest trends and couture wedding fashions…so of course they included Adorn Brides. The editors loved the notion that we bring the red carpet experience to anyone who wants to rent jewelry! The article featured the Hartley Earrings, Ascott Necklace and Masterson Bracelet. 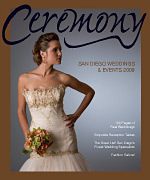 Ceremony Magazine—San Diego (2009)—article on page 28: Something Borrowed— The editors of Ceremony Magazine were so excited to learn about our new fine jewelry rental service! Eager to share this new idea with their readers, they explained the basics of the service and featured a picture of the Clemons Earrings. This season Adorn Brides caught the attention of the editors of Grace Ormonde Wedding Style New England. We were featured along side two stunning Vera Wang gowns and Badgley Mischka silk satin pumps. 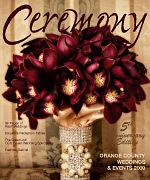 Ceremony Magazine featured the Clemons Earrings in their recent article about Adorn Brides’ fantastic service. 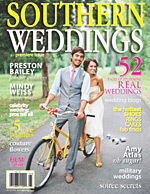 Southern Weddings (January 2009)—mention on page13: Fabulous Finds— We are honored to be included in the premier issue of Southern Weddings magazine! The editors of this chic new publication took notice of our service and chose to showcase the Ashley Earrings as one of their fabulous finds. Every bridal jewelry rental piece on adorn.com/brides is real diamonds and gold, so think of us as a girlfriend from whom you can borrow diamond jewelry any time you wish! Take a peak at the bridal jewelry pieces shown in the article Ashley Earrings. Ceremony Magazine—Orange County (2009)—credit on page 306: Jennifer Tang & Michael Cole Wedding— We love when one of our very own Adorn brides is featured in a magazine! This time, Jennifer Tang’s lavish event graced the pages of Ceremony Magazine’s Orange County edition. She selected the Clemons Earrings to compliment the intricate detailing on her Reem Acra gown. Jennifer selected the Clemons Earrings to complete her bridal look. Grace Ormonde (2009)—Grace Ormonde - Wedding Style New England—As chic and timeless as its parent publication, Grace Ormonde Wedding Style New England magazine captures the most current fashions for the bridal industry—straight from the runway. 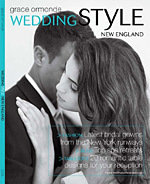 Written specifically with New England brides in mind, this fashion resource is a must have for the bride who insists on a of couture fashion for her event. Take a peak at the Masterson Bracelet. We love that everyone is noticing the bridal jewelry rental trend that Adorn Brides is creating! 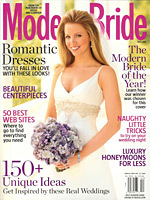 Modern Bride (Fall 2008)—article on page 298: 50 Best Web Sites for your wedding— In this article, written by Lauren DeCarlo, Adorn Brides is shown as the #1 web site for weddings and falls under the Accessories category. 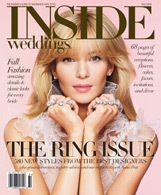 Inside Weddings (Fall 2008)—article on page 30: Something Borrowed— Dazzling wedding-day jewelry need never be costume again. Adorn Brides will lease you the genuine diamonds and pearls of your dreams for a mere fraction of the retail price. Bracelets, earrings, and necklaces are available alone or in sets and are delivered via UPS two days before your event date. Make sure you return your baubles on time or you'll face severe penalties -- after all, another beautiful bride is awaiting her turn to shine. Take a peak at the bridal jewelry pieces worn in the article -- Ascott Earrings and the Ascott Necklace. Grace Ormonde - Wedding Style—If you’re not familiar with Grace Ormonde Wedding Style magazine, you need to be! As one of the industry’s most chic publications, the styles and designs which grace the pages of both the magazine and the website www.weddingstylemagazine.com, are always stunning and impeccably selected. Recently Adorn Brides caught the attention of the editors of Grace Ormonde Wedding Style and two of Adorn’s most beautiful bracelets were featured in the “Hot Picks” section. Take a peak at the Bates Bracelet and the Lloyd Bangle. Even Grace Ormonde is loving bridal jewelry rental trend that Adorn Brides is creating! 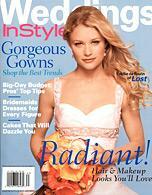 InStyle Weddings (Summer 2006)—article on page 130: Lease Your Baubles. Renting jewelry isn't necessarily inexpensive, but the right piece can be so spectacular that no other adornment is required. Gala Weddings (2006)—article on page 10: Star Appeal. Think movie stars have all the fun? Think again. High-end jewelers also cater to brides looking to rent incredible accessories for their walk down the red carpet, er, aisle. New York, NY; (February 26, 2006)—Bert Stouffer, founder and president of Adorn Brides, appeared in a New York Times newspaper article: When Something Borrowed Means the Dress, by Gerit Quealy. The article, published February 26th, explored the recent trend toward an increasing number of brides who are renting personal items such as their wedding gowns for their special day. 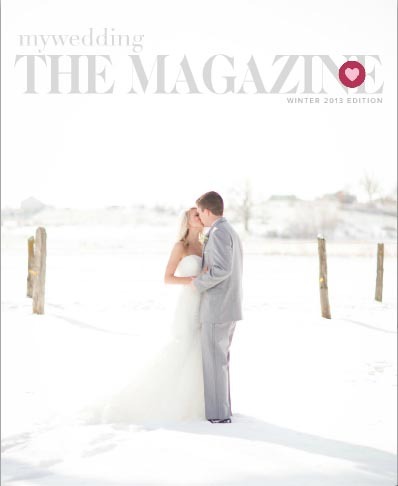 Mywedding.com (Winter 2013 Edition) —We are so excited to welcome the new year – and with this new year, thrilled to announce the launch of mywedding The Magazine. Our very first edition is now available online and in the Apple App Store and we think it is entirely safe to say that we could not have made this new source of inspiration available without you, thank you Adorn. Photo-shoot includes: Lockwood Earrings, Rorey Earrings, Mason Bracelet, Masterson Bracelet, The Marilyn Clutch & Sophia Clutch. iVillage (August 2013) —Bling it on! The Very Best Places to Borrow or Rent Jewelry Online By Alesandra Dubin All the sparkle, none of the commitment. Adorn, as we've told you before is an incredible place to rent bridal jewelry. But it works just as well for any other special occasion too. For a dramatic look for a major milestone birthday or anniversary, for instance, how much would you love to rock this gorgeous diamond cuff bracelet(Chadwick) It rents for a splurgy $260, but it retails for a not-going-to-happen $26,250. Crossing “something borrowed” off your wedding day checklist has never been so chic. That’s because now you can rent – for a fraction of the retail cost of owning – fine diamond jewelry for royalty. Click here to view online article at ColinCowieWeddings.com. Imagine wearing a $27,000 necklace to perfectly complement your wedding gown—perhaps a necklace that's dripping in four carats of diamonds. Adorn.com is a fine jewelry rental website that specializes in wedding accessories. The site is easy to navigate and offers free jewelry consultations. Just send their stylist details of your dress, your dream jewelry, and any hair accessories you'll be wearing, and she'll return jewelry recommendations that will seamlessly match your big day look. Click here to view online article at BridalGuide.com. Click here to view online article at womansday.com. Why own when you can rent? Good question, sometimes...many consumers are content with simply accessing products or services instead of owning them. Click here to view online article. Click here to view online article at baltimoresun.com. Nestled between those who live for luxury and those who couldn’t care less about it is a group of people who would love to buy high-end goods but either can’t justify doing so or simply can’t afford to. Lucky for them, a handful of companies are helping to bring the lifestyles of the rich and famous to the masses including Adorn. Click here to view online article at Foxbusiness.com. ABSTRACT: ON AND OFF THE AVENUE about consumer rental services. Temporary possession, especially in this declining economy, may not be such a bad idea. By ELLEN GIBSON - NEW YORK (AP) - Brides-to-be who don't have the funds, or the stomach, to spend thousands of dollars on a dress they'll wear only once don't have to pass up Italian silk for plain polyester. Included in her six tips for scoring Madison Avenue glamour on a real-life budget. Click here to view full online article at msn.money.com. CBS Early Show (Aug 2, 2010)—Recreate Chelsea Clinton's Wedding On a Budget - Carley Roney, editor in chief of TheKnot.com, shared how you can recreate the lavish presidential affair for less. The segment featured several of Adorn’s pieces including the Shaye Earrings, Abbott Earrings, Masterson Bracelet and the Clark Bracelet. Bride Buzz (March 22, 2010)—The ladies at Bride-Buzz.com are raving about Adorn’s bridal jewelry rental concept. This new daily e-newsletter (just like Daily Candy …but for brides) just launched in January of 2010, but is already boasting a huge readership. 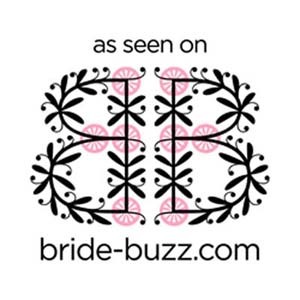 Bride Buzz is full of helpful wedding planning tools and helpful information. Of course, letting their readers know that they can borrow bridal jewelry is a great wedding tip! Bride Buzz featured a number of earrings including the Chadwick Bracelet, Miles Earrings and Lockwood Earrings. SmartMoney.com (Feb 11, 2010)—As a follow up to a 2008 article, SmartMoney.com published a list of “10 Things Millionaires Won’t Tell You”. In addition to surprising admissions like shopping at budget stores, the article points out that many savvy consumers are opting to rent luxury items rather than buy. The concept that you can rent jewelry is catching on! USMagazine.com (Sept 28, 2009)—Dream Wedding Winners- The Wedding Channel and US Weekly Magazine teamed up to award one lucky couple their dream $100,000 wedding in Washington D.C. Of course, what dream wedding is complete without borrowing diamond jewelry! The bridal party was adorned with over $250,000 worth of diamonds on loan, making the big day a red carpet worthy event to remember. The bridal party dripped in diamonds including the Lockwood Earrings and Crestwood Necklace. People.com (July 5, 2009)—Basketball Star Brian Cook Weds- NBA power forward Brian Cook wed Victoria Velasquez on Saturday at the Trump National Golf Club in Palos Verdes, CA. The highlight of her evening? Being decked in almost $75,000 worth of jewelry from Adorn Brides of course! The bride loved her jewelry on loan so much that she asked if she could buy her bracelet—Of course you can! The bride sparkled in Bailey Earrings and Chadwick Bracelet among others. Glamour.com Daily Beauty Blog (July 27, 2009)—Engaged Daily Beauty blogger Petra is going be decked in diamonds her upcoming wedding. In preparation for her event, Petra put the call out to her readers to help her decide on which Adorn Brides earrings she should borrow. Petra’s blog featured a number of earrings including the Whittaker Earrings and Shaye Earrings. Lucky.com Style Steals blog (June 17, 2009)—Editor in Chief of Lucky Magazine, Elise Loehnen, took notice of our recession friendly service and blogged away! Cooing over our assortment of fine diamonds for rent, Elise also (ingeniously) suggested the service is perfect for other events too. Lucky.com featured the Lighton Necklace. Glamour.com Slaves to Fashion Blog (June 17, 2009)—Adorn recently caught the eye of glamour’s hot fashion blog “Slaves to Fashion”. Adorn Bride, Connie Haralson, was interviewed and shared how she was able to borrow bridal jewelry and feel fabulous. Slaves to Fashion featured a number of earrings including the Danielson Earrings and Lockwood Necklace.